Watch any football game of today and you’ll be amazed that the players seem superhuman despite facing tackle after tackle, with no sign of fatigue or pain. Many coaches and team physicians have also seen these happen right in front of their eyes and are wondering how the players endure such punishment, leading to several college teams teaming up with Simbex to create the Head Impact Telemetry (HIT) System. This is the first and only commercially available system which is capable of measuring head accelerations (a more sophisticated word for impact) in real time during games and practices. The HIT system comes with a sensor/encoder which comprises of impact sensors, a processor and transmitter, turning any helmet or headgear into an instant head impact monitor. The data collector within receive impact data in a continuous flow from encoders which are located several hundred meters away and is capable of monitoring dozens of players simultaneously without blinking an eye. A pager warning will be sent if any impact has a potentially injurious profile, enabling coaches to prevent players from playing through the pain barrier – a move that could save lives. All key signatures of impacts ranging from peak linear acceleration, rotational acceleration, duration, location, and time stamp are stored by the data collector for further analysis. 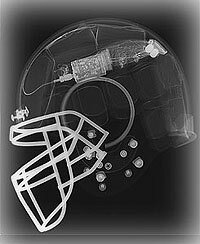 Hopefully the study of such data will be able to shed new information on the biochemical causes of mild traumatic brain injuries, leading to better protective equipment and a less dangerous game on the field.